Officials in Cary, North Carolina, removed three paintings by Chinese artist Weng Bing from an exhibit because they had unacceptable “political” content that was “inconsistent” with the work Weng showed them when he applied for a permit, according to a report citing Weng this week. 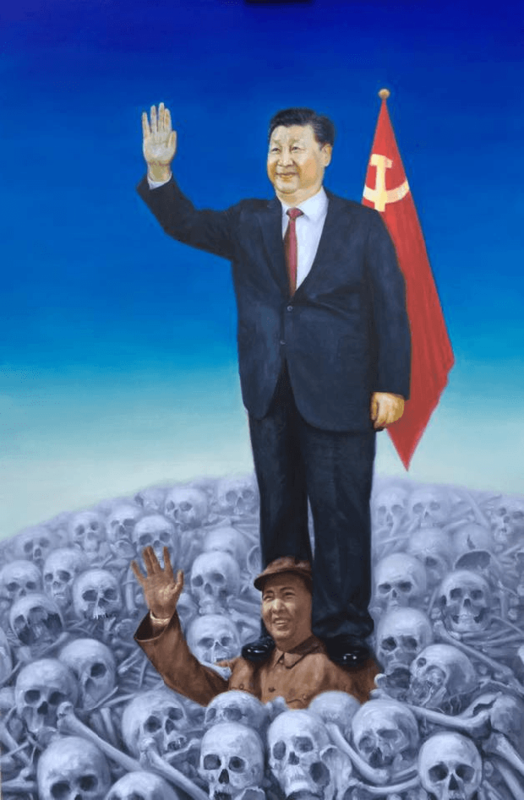 One of the banned paintings shows current Chinese Communist Party head Xi Jinping standing on the shoulders of former Chinese tyrant Mao Zedong, who in turn is buried in a mountain of human skulls. Town officials told RFA that Weng surprised them with the political paintings, which were different in character from the work she showed them when applying for an exhibit at the Cary Senior Center. The exhibit is scheduled to run through February 15. Weng recalled how she was forced to remain silent about human rights abuses by China’s authoritarian government when she lived there, citing the example of female activist Dong Yaoqiong, who was condemned to compulsory “psychiatric treatment” after splashing ink on a post of Xi Jinping last July. “I was in China when she did that, and I wondered how it was that someone could just disappear after splashing some ink on a portrait. I was very angry and felt for that young woman,” Weng said. She conceded that the three paintings removed from the exhibit were not part of her original application because they did not yet exist – she began the application process a year ago and did not craft the three banned works until November. She insisted she was never told that political artwork would not be allowed at the exhibit. 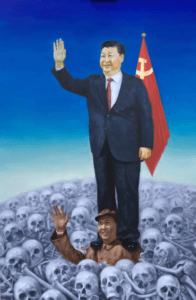 It should be noted that Weng’s picture of Xi and Mao only captures the tiniest fraction of the mountain of skulls they would be standing upon. Mao killed 65 million Chinese by the time he was done. To give a real sense of how high that pile of skulls would be, Weng would have to create a painting so large that it could only be displayed by hanging it from one of the tallest buildings in North Carolina. Zhou Fengsuo, a veteran of the 1989 [Tiananmen Square] protests who now lives in the U.S., said Weng is using her art as a form of protest against dictatorship under Xi, who recently began a second, unlimited term in office. 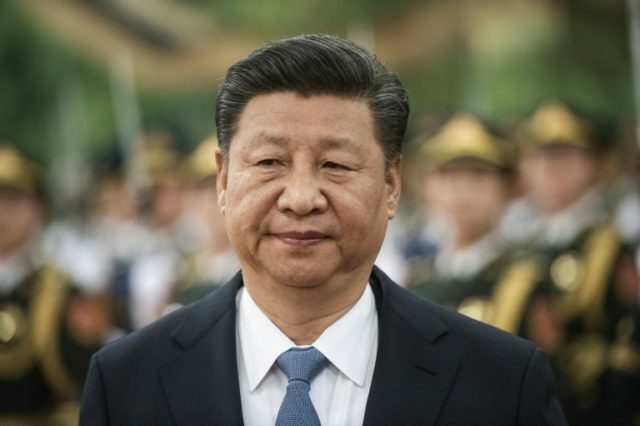 “It doesn’t matter where you are; there are always going to be people who don’t like it – Chinese people who’ve been brainwashed by the Chinese Communist Party, and who protect its interests,” he said. No one quoted by Radio Free Asia directly accused Cary officials of caving to pressure from the Chinese government when it banned Weng’s political pictures, and it is not uncommon for political work to be excluded from purportedly non-political events, but China does have a habit of flexing its muscle against citizens of free countries who violate its speech codes. Studies have found Chinese people living overseas are particularly susceptible to bullying by Beijing, even when they have personally obtained citizenship in free nations, because they worry about the fate of relatives back in China and fear they might be prevented from visiting them or conducting business with Chinese firms.